Killarney House and Gardens is a treasure of the Killarney National Park that is located on the doorstep of Killarney town centre. The house and gardens offers a sanctuary away from the hustle and bustle of the busy town. Its weaving pathways through carefully manicured gardens provide an oasis of calm. Much more than that, Killarney House is an ideal starting point for a journey exploring the wonders of Killarney National Park. The ‘Golden Gates’ that stand guard at the main entrance form a portal to the wonders of the National Park beyond. As you pass through these (black!) gates, the sounds of the town fade away and the magic of the Park begins to wash over you with each step you take. In recent decades, the splendour of Killarney House & Gardens lay hidden behind high walls in one of the lesser visited parts of Killarney National Park. Although the grounds were always accessible, the house itself lay neglected and the surrounding gardens had long surrendered to the wild. The much loved Cherry Walk was a popular local pathway to the Knockreer area of the National Park. Yet few veered far from the cherry blossom -lined avenue to explore the environs of Killarney House. The relevant obscurity that befell the house and gardens was hard to comprehend given its proximity to Killarney town. Following the completion of extensive restoration and reconstruction work in 2016, the house and gardens have been restored to their rightful place as the gateway to Killarney National Park. Killarney House is located just a few hundred metres from Killarney town centre. The entrance to Killarney House at the ‘Golden Gates’ is where Muckross Road, Countess Road and Kenmare Place meet at a small roundabout. The nearby Methodist Church is the closest landmark to the Golden Gates entrance. There is a second entrance from Mission Road beside the monument to Monsignor Hugh O’Flaherty. Finally, you can access the House and Gardens via a gateway in the Knockreer area of Killarney National Park. All three entrances to the House and Gardens provide pedestrian access only and the gates are locked overnight. Entrance to the grounds of Killarney House are generally from 9am to 6pm although this is extended sometimes during the summer months. Guided tours of Killarney House take place every 30 minutes during the months of April to September. Killarney House has a long and complicated history. The original ‘Killarney House’ was home to the Earls of Kenmare and was built in the early 18th century. Known locally as ‘The Mansion’ – (how imaginative…), this sprawling structure was considered one of the finest mansions in Ireland at the time. The house succumbed to fire in 1913 and all that remains today are the stepped gardens and some of the original gate lodges. Knockreer House now occupies the site of the original ‘Killarney House’ and continues to enjoy the marvellous elevated views of Lough Leane and the McGillycuddy Reeks. After the fire that destroyed Killarney House, the Kenmare family relocated to a renovated stable block of the nearby ‘Kenmare House’. After the death of the last Earl of Kenmare in the 1950s, Kenmare House and its adjoining lands were sold to an American investor syndicate. Finally the property was purchased by Irish American property developer, John McShain and his wife Mary. The McShains renamed the property ‘Killarney House’ and thus what we now know as ‘Killarney House’ came into being. Over the intervening years, the McShain family used Killarney House as a summer home, and in their latter years as their primary residence. The family arranged for the property to be sold to the Irish state with a proviso that they would retain usage of the house and gardens for the rest of their lives. Following the death of Mrs McShain in 1998, Killarney House became a welcome addition to Killarney National Park. For a wonderful reference guide on the history of Killarney, check out Killarney History and Heritage book – a mine of information about Killarney. In the years that followed, Killarney House and Gardens fell into disrepair and neglect behind the high walls that encircled it. in 2014, the house and gardens were closed to the public to enable the extensive reconstruction works to be completed. Finally in 2016, Killarney House and Gardens was re-opened to the public. Following the opening of the Gardens, the house itself opened to the public in July 2017. Harking back to its former glories, the House and Gardens have been firmly re-established as a favourite with locals and visitors alike. The gardens, fields and meadows in the vicinity of Killarney House have always held a special allure for the people of Killarney. The looming house in the background was often taken for granted, especially during its unoccupied years. As youngsters, we often played in the adjoining fields – never for a moment contemplating the beauty and history that surrounded us. Those same meadows were often used for football and soccer matches and athletic meetings for local schools and clubs. With the McGillycuddy Reeks and Lough Leane on one side and Killarney House on the other, it made for a special arena – a field of dreams of a different kind. More recently, Killarney House and Gardens was to be transformed into a concert arena to host a music festival. The ill-fated venture never transpired but the controversy at the time helped to reignite the conversation to have Killarney House and Gardens re-opened to the public. Availability Open All Year. Gardens Opening Hours are 9am – 6pm (extended in summer). Guided tours of the House are available. The gardens in the immediate vicinity of the House includes several seats, benches and nooks and crannies to sit and watch the world go by. The planted beds and tree lined pathways provide a circuit to wander the gardens. The newly-planted cherry blossoms trees flank an avenue that has been revered by walkers and strollers since the gates were first opened. A grand promenade of flag stones has been reinstated in front of the house – a reminder of times gone by when the residents and guests of the house stepped out to take in the magnificent views. The towering rows of trees that climb above the boundary walls muffle the sounds of the town on the other side. As dusk approaches, roosting birds take over these same trees to signal the close of day. Killarney House and Gardens is the perfect place to while away an hour and get away from it all. It’s an ideal place to bring the kids for a wander around the gardens. You can start your adventure in the National Park from the grounds of the house as you head off for Knockreer or Ross Castle. If you’re taking the dog for a stroll or heading out on a run, where better to go? Even if you’re just using the route through the gardens to get to the other side of town, it’s a wonderful detour. And therein lies the attraction of Killarney House and Gardens – so much to do, so much to offer and just a couple of minutes stroll from one of the busiest tourist hotspots in the country. Killarney is sometimes referred to as ‘the town in the Park’, as it is surrounded by the National Park. Nothing embodies this claim better than Killarney House and Gardens. It is a portal to the wonders of Killarney National Park. This sleeping beauty was awakened from its slumber when it was re-opened to the public in 2016. A new generation will now enjoy its splendour and beauty and so begins a new chapter in the long and varied history of Killarney House and Gardens. Thanks for the comment Nigel. It is a great spot with loads to see and do! Looking forward to visiting Killarney House and Gardens this year. Thanks for visiting the site Patricia – enjoy your visit to Killarney House! Let us know how you get on. Hi Sheila, thanks for visiting the website. Hi Sharon, thanks for visiting the site and leaving a comment. Enjoy your time in Killarney! I was disappointed at the unimaginative gardens attached to Killarney House. Surely you could make it more biodiverse and include far more native plants – as we are all being asked to do. I could see that it was planted for easy maintenance, but that isn’t the point in such a beautiful place. Hi Elizabeth, thanks for visiting the site and leaving a comment. This website is not an official site for Killarney House & Gardens. The National Park contact details are below. I agree it would be great to have more native plants if possible but perhaps an enquiry to National Park officials might be worthwhile. Hi, I have been to Killarney for at least ten times now and always wondered why the people leave this sleeping beauty unattended almost in the middle of their lovely town… I’m looking forward to visiting the house and gardens this summer! Haven’t thought there might actually be something completely new for me to discover in Killarney! Thanks for leaving a comment Suzanne. It really is great to see Killarney House and Gardens open again, you’re in for a treat on your next visit! Tuesday 13th Feb 2018 .
and many more to come. I would highly recommend this tour and our guide . Grand walk in the gardens where there is a mighty backdrop of the local mountains. Gur a Maith agaibh go leir. Thanks for leaving a comment and sharing your experience of Killarney House! Nice to see Killarney House restored in such a lovely park. looking forward to seeing the upper rooms on a future visit. Many thanks. Hi Helena- thanks for leaving a comment. The House and Gardens are looking great at the moment alright. It’s a wonderful asset on the doorstep of the town centre- we are lucky to have it. thanks for leaving a comment on our website. I’m sorry to hear that you did not enjoy your visit to Killarney House. This website is an independent site and is not affiliated with Killarney House in any way. I would suggest you contact Killarney National Park directly to give this feedback to them so they can address your issue. They have an email address infokillarneyhouse@chg.gov.ie that you could contact. Seems as if there’s plenty to keep us occupied on our short visit which we are looking forward to. Had the tour around the house this afternoon and just wanted to say the guide, Paul, was excellent. Are gardens wheelchair accessible? What is adult/child entry please? Hi Mairead, thanks for leaving a comment. From my own experience, the gardens are wheelchair accessible as there are many paved paths. Some of the other paths have some loose gravel but all are flat and there are no steps. 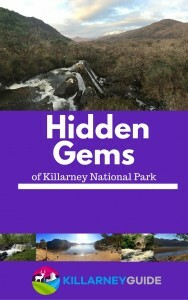 thanks again for visiting the KillarneyGuide.ie website. John McShain was a Developer, Master Builder, and Philanthropist, who constructed The Jefferson Memorial, The Pentagon, restored The White House, built The Kennedy Center, as well as many additional Civic, University buildings, and Catholic Churches in Washington DC and Philadelphia. John McShain was also owner of the esteemed thoroughbred racing horse, “Ballymoss,” who won the Irish Derby in 1948. John McShain’s father, John Joseph McShain Sr. was originally from County Derry, and emigrated in 1882 with his wife, Catherine to Philadelphia- where his name changed spelling from the traditional “McShane,” as he began the family’s successful American construction business. Later, the younger Builder, John McShain along with his wife, Mary Horstmann McShain, returned to Ireland to live out their Joyful years in County Kerry. Thanks so much for leaving a comment about the article. I have updated the spelling to ‘McShain’! thank you! Thanks again for visiting the website and leaving such an informative comment for all other readers. No picnic benches found anywhere around Killarney or in the parks..
maybe i missed them..Doesent make it easy for families or hikers..